Our worship is led by our Pastor, the Rev'd David Bedford. The theme is 'Blessed are the pure in heart'. Our worship is lead by our Pastor, the Revd. David Bedford. The theme is 'Blessed are the peacemakers'. Our worship is led by our Pastor, the Revd. David Bedford. The theme is 'Blessed are the persecuted'. The service includes a celebration of the completion of, and payment for, the 'Oasis Courtyard' project. PLEASE BRING YOUR OWN LUNCH if you are staying for the Church Meeting, which begins at 12.30 pm. Our worship is led by our Pastor, the Rev'd David Bedford. It includes '30 Pieces of Silver' and Communion. This is a time to reflect and pray on the eve of Good Friday. Our worship will include symbolic washing of hands, snuffing of candles, sharing bread and wine, and an opportunity to consider how much of Judas is in us all. Our worship is led by the Revd. David Skitt. Hosted by Pastor David & Lorna Bedford. Please let one of them know if you would like to attend. Tea and cakes will be served. Transport is available. The only qualification for membership is that you have chosen to be a follower of Jesus. This is the first meeting of this group. All are welcome. 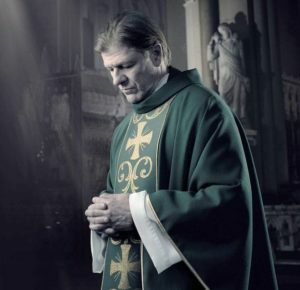 This is the first of six evenings for anyone curious about the Christian faith to explore it through the TV series 'Broken', in which a priest (Sean Bean) wrestles with his beliefs and some of life's toughest situations. The series confronts themes that some may find challenging, including abuse, suicide, poverty, addiction, sexuality, justice, and relationships. It is intended for over 18s seeking to explore the Christian faith, and how God might be speaking in such situations. The sessions will run in The Living Room at Dorking URC on 8th 15th 22nd May, 5th 12th 19th June and all will start at 7.30 and aim to be over by 9.30. Tasks include preparation of the railings, at the front of the church premises, for repainting. All are welcome. Our worship is led by Pastor David & Lorna Bedford. The theme is 'Church built on Jesus' Love'. Our worship is lead by our Pastor, the Revd. David Bedford, and Lorna Bedford. It is to be based around football, as the 'World Cup' matches will be in progress. Please come wearing your team's football (or rugby) shirt. 'Would you Adam and Eve It! Our worship is led by David Howell. Talk given by Sue Tunbridge: 'My journey from the "Black Country" to Dorking'. Our worship is led by our Pastor, the Revd. David Bedford, and Lorna Bedford. Burgers/hotdogs/bric-a-brac and lots of other stalls and games. Any donation of cakes would be gratefully received. 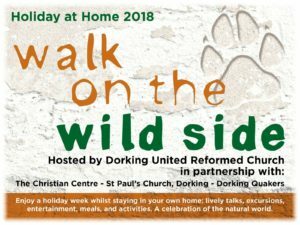 Dorking URC are really pleased to be hosting Holiday at Home again from 20th to 24th August 2018. The theme this year for this very popular week of talks, activities, meals, excursions, and great company whilst still sleeping in the comfort of your own home, is Walk on the Wild Side. It will be a week packed with events to celebrate the amazing natural world around us. Talks will include a chance to discover the wildlife in your own garden, hear about the hunt for an ancient desert in the Scottish Highlands, learn about the legacy of Elsa the ‘Born Free’ lioness, and take a butterfly walk up Box Hill without leaving your chair. The Main Hall at Dorking URC will become the ‘Hotel Lounge’ for the week, with coffee being served each morning and tea and cake each afternoon. Jigsaws, art activities, films and other entertainments will be available, along with sofas and comfy chairs to sit and relax in. 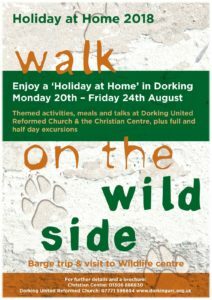 Talks will take place in the Little Chapel, which is adjacent, and Dorking Christian Centre a short walk away will be the restaurant serving lunches each day. Excursions include a trip to a wildlife centre and ‘rides on the wild side’ through the Surrey Hills, and along the Wey and Arun canal in coach and barge respectively. Many of the activities are free (though please still book so we will know the numbers) and there are very reasonable charges for meals and excursions (but please let us know if the cost of these is an issue). There is good disabled access at both Dorking URC and the Christian Centre. Outings will require stepping up onto a coach and the brochure contains details about the accessibility at the destinations, which has been kept as easy as possible. Brochures and booking forms will be posted out to guests who have attended in the past, and can be downloaded using the links below. Please share details of this event with anyone you think might be interested and don't hesitate to contact us if you have any questions at all. For people who enjoy art and craft and who would like to do them with others rather than at home on their own. You are invited to bring your own projects or to try something new with help from volunteers. This meeting will be followed by others on 18th October, 15th November and 20th December (the 3rd Thursday of each month). The cost is £2 per person, which includes the 'cuppa'. Our worship is led by our Pastor, the Revd. David Bedford. The theme is 'Lead us not into temptation, but deliver us from evil'. Light refreshments from 10.00 am; lunch from 12.00 noon. Come and try your hand (or share your skills) in a wide range of creative arts and crafts, with friendly company and refreshments. £2 per person. Here at Dorking URC we are trying to track down our 40 Lost Sheep that have wandered off into shop windows around Dorking town centre. Can you help locate them and find their names please? You can find the list of shops here Sheep Trail 2018 , and your mission (should you choose to accept it) is to note the name of the sheep from the tag on its neck next to the name of the shop where you found it. 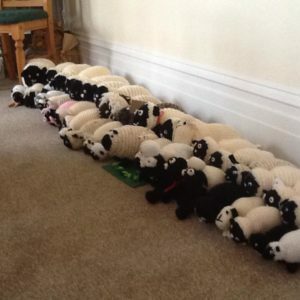 Then you will be on your way to finding the names of the 40 sheep which are all characters from the Christmas Story. The sheep will be around the town between Saturday 1st and Friday 21st December, before being rounded up on Saturday 22nd ready for our Christmas 'Nativitingle' Celebration on Sunday 23rd December. Forms may be returned to the box in the lobby of the church at 53 West Street. You will find it just inside the blue doors between the Worship Area and Main Hall. Here you will also find your reward! Simply place your form in the box and collect your reward. Please return your form on or before the Nativitingle Celebration at 4pm on Sunday 23rd December. A special service including a performance of 'Ba-Ba Bethlehem', Christingles and a special cracker! Our worship is led by our Pastor, the Revd. David Bedford.